Every second Wednesday, a tantalising aroma comes wafting from the Springload kitchen. It’s not the scent of slightly burnt fruit toast or freshly brewed coffee. It’s our multi-talented studio manager Kelly Todd preparing a lunch of epic proportions. How epic? Think 45 growling stomachs epic, with a range of dietary requirements as diverse as the dishes Kelly so skilfully prepares. Whether you’re vegetarian, vegan, gluten-free, low-FODMAP (Fermentable Oligo-, Di-, Mono- And Polyols) or a meat-eater, Kelly can adapt the tastiest of recipes to meet your particular needs. To prepare a meal for so many people is no small order. Kelly’s days are already filled with organising events and replying to hundreds of emails. So when does she find the time to decide what to make? Well it helps she’s a self-confessed food geek. Simple recipes from Anna Jones and Yotam Ottolenghi are Kelly’s favourites. And inspiration frequently strikes when she’s out for lunch or dinner. With a little imagination, she uses her intuition to figure out how to turn a dish for one into a meal for many. One bowl is never enough. Kelly buys all her ingredients fresh on Wednesday morning. Free-range meat and vegetables are a must, and she’s guided by a discerning eye for quality and food source. Once Kelly gets back to Springload, it's time to chop, marinade, saute, roast, boil, and simmer. At her disposal are two ovens, four gas hobs and enough pots and pans to kit out a small restaurant. As she goes about her tasks, she keeps a clear plan of how each component of the meal should be prepared. By the time 12:30 rolls around, lunch is ready to be served. Everybody lines up for their bowl of deliciousness. Thanks to Kelly’s inventiveness, our meals are always interesting – for her and us. One week it might be Argentinian-inspired poached chicken with chimichurri sauce, the next Louisiana chipotle jambalaya. But it’s not all meat all the time. By using more vegetables and less meat, we’re supporting food sources that are environmentally sustainable. It’s one of those cases where making a small change now can have a long term impact. 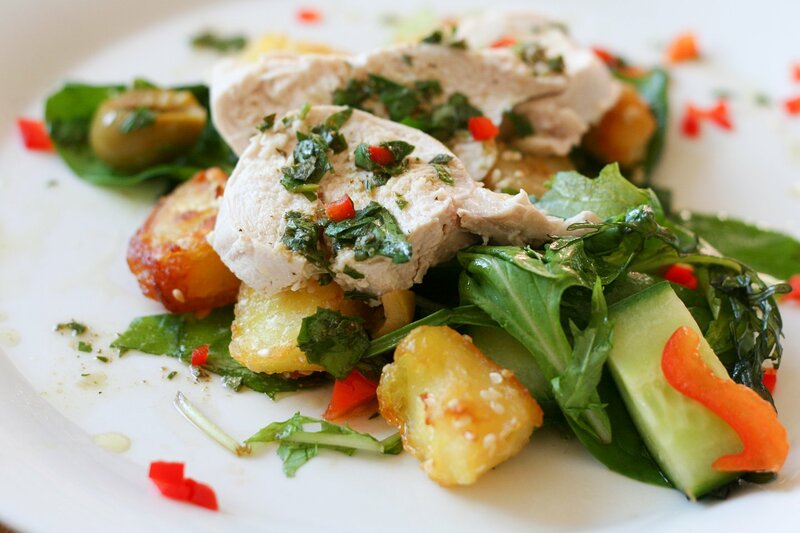 The chimichurri chicken with lemon sesame roast potatoes is a Springload favourite. To meet our broad range of dietary requirements, Kelly has a range of time-tested tricks. Our FODMAPers get their own pan without any garlic or onions. Butter is substituted for oil. If a recipe calls for cream in a sauce, she omits this ingredient so it’s suitable for vegans, and instead offers crème fraîche on the side. All it takes is a bit of culinary creativity, and some sneaky substitutions. Kelly cooks the vegetarian, vegan, and low-FODMAP meals in separate pans, and she’s always careful not to cross-contaminate dishes. Springloaders enjoying the meal, and each other's company, around the lunch table. 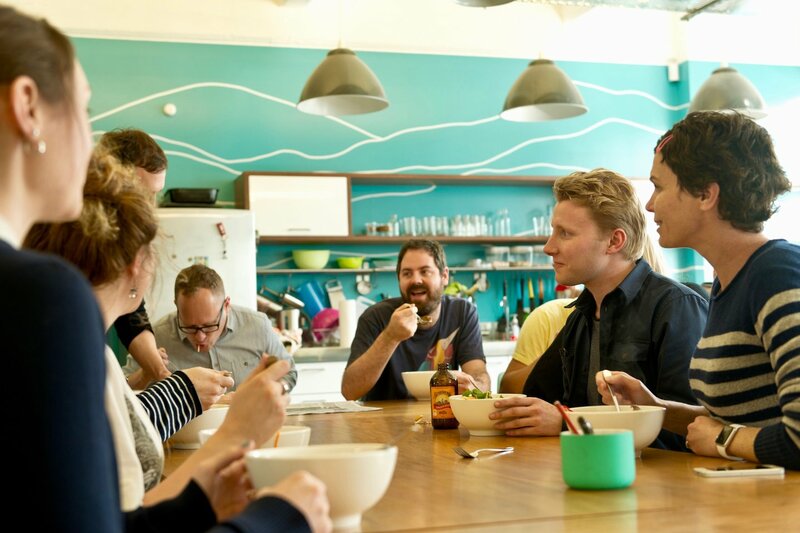 Kelly’s shared lunches are a big part of Springload’s culture. They’re equal parts family meal and school lunch, with everyone lining up and scrambling to find a free seat. For those not working together on a project, they’re a chance to catch up. They create a working space where people feel like they’re part of something greater. And it’s not just anecdotal. 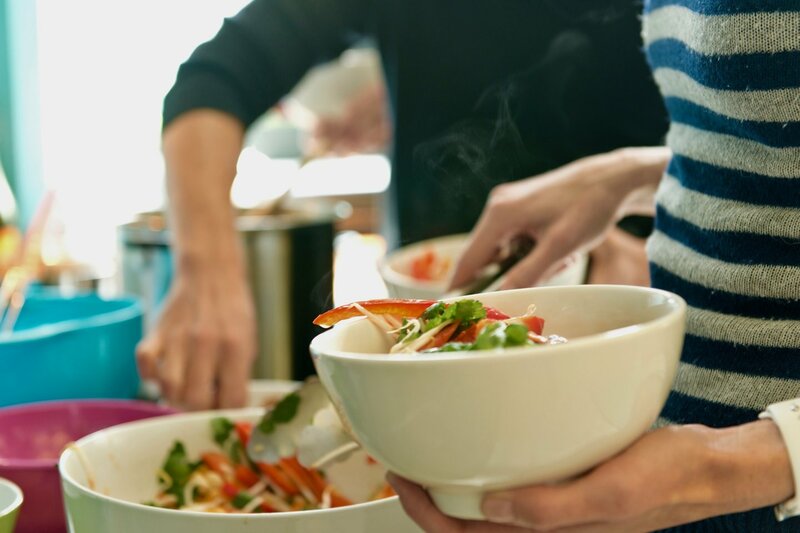 Research has shown that eating together on the job is associated with increased cooperation and better work-group performance. Kelly finds it deeply satisfying to make sure the well-being of the team is cared for. She makes a big effort to make every meal highly nutritious as well as mouth-wateringly tasty – it’s like getting a weeks’ worth of your 5+ a day in one meal. After all, the best work happens on a full stomach. It’s not just a person’s dietary requirements we consider at Springload. 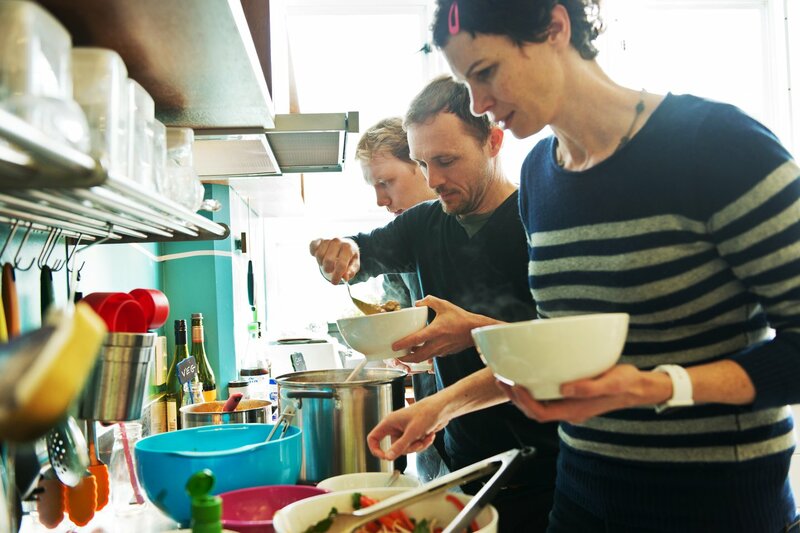 We want everyone to have the flexibility in their working life to cater for their home life. That includes flexible hours, and working from home or remotely – especially if you have a young family. To create a culture that thinks differently, we hire people from a diverse range of backgrounds, experience, and perspective. It prepares us for change, improves innovation, and most importantly helps us better meet the needs of our clients. As long as you’re fired up about your work, and have a glimmer of humour, you’re welcome at Springload. At the very least you’ll be well fed. Sound like you? Have a look at our current openings or get in touch for a friendly chat. Hopefully yours looks as good as this. Mix all the dry ingredients together: panko crumbs, almonds, spices, lemon zest & salt. Add the melted butter, up to ¾ lemon juice and egg white until all the crumbs loosely stick together. Do this in stages to get the desired texture. Grease the base of your baking trays. Use 2–3 trays, do not overcrowd them as you want the topping to crisp up and the fish not to braise. Lay the trevally out. Lightly season with a touch of salt and sprinkle with remaining lemon juice. Evenly distribute the topping and lightly press down until each fillet is nicely coated. You may want to prepare the slaw at this stage. If so, cover the fish and pop in the fridge until you are ready to cook it. Bake fish in the oven for 10–12 minutes (depends on the size of your fillets) until it’s just cooked through and the topping is crispy and nicely browned. Combine the cabbage & carrot. Chop the jalapeños and coriander, then add to the cabbage and carrot. Mix in the capers and lime juice to taste. Combine the mayonnaise & chipotle sauce. Substitute the fish for a portobello mushroom (with stalk removed). Allow to cook for an extra 10–15 minutes at 180ºC. If the breadcrumbs look like they are browning too much then cover with foil. For the breadcrumbs: Swap the butter for a dash of extra virgin olive oil. Optional: For extra umami flavour you could gently fry a clove or two of garlic in the oil first, add a teaspoon of miso concentrate, or a small teaspoon of dijon mustard. Omit the egg white (its purpose is only to provide extra crunch for the breadcrumbs). If the mixture is too dry then add a touch more lemon juice & oil, or even a splash of water. For the mayonnaise: Either substitute for a vegan mayonnaise, or use the chipotle on its own instead of mixing with mayo. 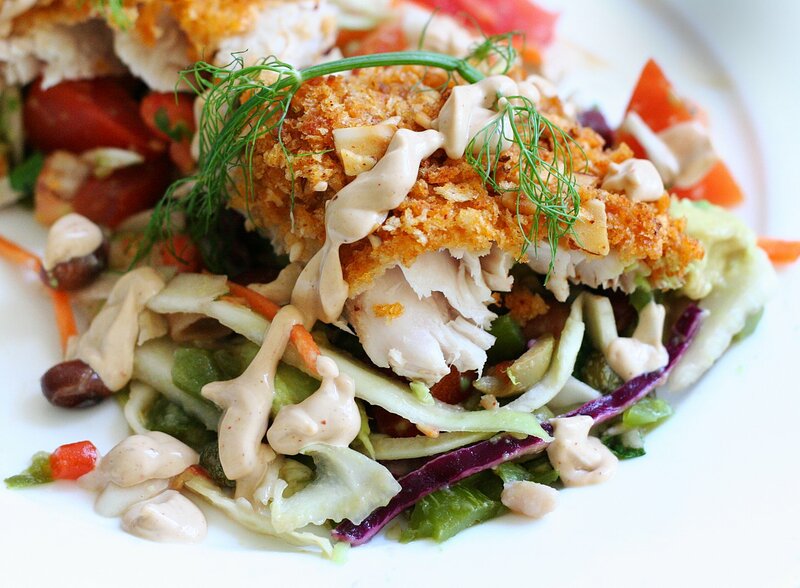 Substitute panko for gluten-free breadcrumbs. Dry out a few slices of gluten-free bread in the oven 150ºC for about 20 minutes. If you only need to substitute for one or two gluten-free diets, be careful to keep the gluten breadcrumbs separate. Use a different bowl & utensils, and cook these fish on a separate baking tray.